Well-known women’s rights organization, Women Against Sexual Violence and State Repression (WSS), in a statement*, has said it is alarmed by the majority judgment of the Supreme Court regarding the August 28 arrests of Sudha Bharadwaj, Vernon Gonsalves, Arun Ferreira, Gautam Navlakha and Varavara Rao, terming it as “short-sighted”, adding Justice DY Chandrachud’s dissenting judgment is “exhaustively reasoned”. WSS is deeply condemns the majority judgment of the Supreme Court which has dismissed the PIL filed by Romila Thapar, Devaki Jain, Satish Deshpande, Prabhat Patnaik and Maja Daruwalla and has in effect granted the notorious Pune Police impunity to carry on with its fabricated and malafide investigation in the Bhima Koregaon (FIR No. 4/2018) case. The Court in its vague majority judgement has failed to do its duty as a Constitutional Arbitrator and as the vanguard of the fundamental rights under Articles 14, 19 and 21 of the Constitution of India to protect the liberty of the dissenting activists, who have been arrested by the Pune police which unabashedly flouted due process. The short-sighted majority judgement has held that there is no form of malice in the investigation conducted by the Pune Police and refused to interfere with the current investigation and dismissed the prayer demanding that the investigation be referred to a Special Investigation Team (SIT). It has further held that the arrests were not initiated to curb dissent but to investigate the connection of the aforementioned activists Advocate Sudha Bharadwaj, and activists Vernon Gonsalves, Arun Ferreira, Varavara Rao and Gautam Navlakha, to banned organisations. On the other hand, the exhaustively reasoned dissenting judgment of Justice D.Y. Chandrachud most explicitly states that on inspection of the evidence submitted by the Maharashtra Police, its claim of connecting all the accused persons to a banned organisation is contrary to logic. He further takes cognizance of the use of electronic media by the Maharashtra for besmirching the reputation of the above activists. The dissenting judgment deemed the press conferences held by the Pune Police and the leakage of such letters which are still under investigation stage, ‘disturbing’ and to be “causing serious concern” and holds that the manner in which the ADG has behaved casts a cloud on the investigation and purports bias on the part of the Pune Police. Furthermore, he also specifically mentions and condemns the vilification campaign run by Republic Channel against Sudha Bharadwaj, who is one of the arrested activists and member of WSS. He further goes on to say that the police are not adjudicators nor can they announce guilt and very strongly asserted that the Pune Police “is manipulating public media” to create and facilitate a media trial. He further in his judgment takes stock of the lack of credibility in the letters and finally holds that “the conduct of the Pune police fortifies the need to a fair investigation” and that “Dissent is a part of a vibrant democracy”, however unpopular the dissent is Criminal law is amenable to Constitutional mandate and hence the court as the constitutional arbitrator has the duty to exercise its jurisdiction under Article 32 to ensure that liberty is not sacrificed at the altar of conjecture. In the past few weeks we have been witness to several judgments of the Supreme Court such as the Adultery Judgement, the Sabrimala Judgement, and the Sec. 377 Judgement, where civil rights and liberties have been invoked and elaborated upon, loftily reading them as the spirit of the Constitution and the democratic framework. As these civil liberal claims are given a much needed boost and careful articulation by the Supreme Court, matters of political import have met with a cold, rigid, conservative approach. All these lofty judgements and the principles on which they are based will cease to have meaning if they are not applied by the court in cases where individual liberties and claims are impinged upon by the State. WSS reiterates its strong condemnation of the targeting of dissent and suppression of all resistance. The attack on democratic rights activists, lawyers, journalists and writers has happened in draconian waves, where those active in defending the arrested are picked up in the next round of arrests. 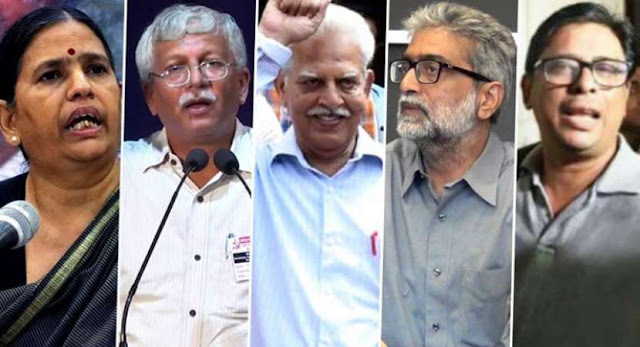 The first round of arrests in this particular Bhima Koregaon case targeted WSS member Professor Shoma Sen, Advocate Surendra Gadling, activists Sudhir Dhawale, Rona Wilson and Mahesh Raut. Advocate Surendra Gadling was the lawyer for Prof GN Saibaba, Mahesh Tirki, Vijay Tirki, Pandu Narote, Hem Mishra and Prashant Rahi, while the others arrested with Advocate Gadling were active in condemning that round of arrests. Prof Shoma Sen was Head of the English Department at Nagpur University and a dedicated feminist and anti-caste activists and two months away from superannuation at the age of 60 when she was picked up by the police. Mahesh Raut however appears to have been solely targeted for being active against state sponsored displacement in Gadhchiroli and in trying to implement Constitutional provisions safeguarding adivasi rights. It appears that the attack on Sudha Bharadwaj was likewise primarily targeting her work on the ground as a lawyer and trade unionist in implementing Constitutional provisions in safeguarding adivasi land rights and labour rights for the last three decades in Chhattisgarh. As part of Janhit, an organization providing legal aid, she has taken up cases of illegal land acquisition, violations of forest rights, environmental issues, forced evictions, human rights violations, and violations of laws like the Forest Rights Act and Panchayats Extension to Scheduled Areas (PESA), etc. Apart from the scores of cases she has fought for workers across the state. Sudha had also spoken out against the previous round of arrests through the long-standing civil liberties organization, People's Union for Civil Liberties (PUCL), and the Indian Association of People’s Lawyers. The repeated and concentrated attacks against Advocate Surendra Gadling, and then Advocates Sudha Bharadwaj and Arun Ferreira who were active in protesting the arrest of a lawyer who is just doing his job in defending his clients from marginalized dalit adivasi Muslim and bahujan backgrounds, show a clear pattern of clamping down on dissent even within the framework of the court system, not to mention clamping down on the social activists working outside the court system in civil society. This has a chilling effect on all activists standing with marginalized communities and sends a clear message that marginalized communities have no hope in fighting for the on-ground implementation of their Constitutionally guaranteed rights. The entire framework of the Unlawful Activities (Prevention) Act (UAPA) has no place in a modern democratic system and the time has come for the Constitutional courts to hold this draconian law as unconstitutional for violating the rights of countless citizens. It is well known that in UAPA cases, the chances of bail are minimal and the time spent in custody by those charged is effectively used as punishment. It is a fear mongering and vindictive tactic of branding. Whatever happens in the court, the larger political struggle for democratic rights and opposing UAPA, and opposing the corporate assault on adivasi people in the greed for mining these lands will continue and intensify.